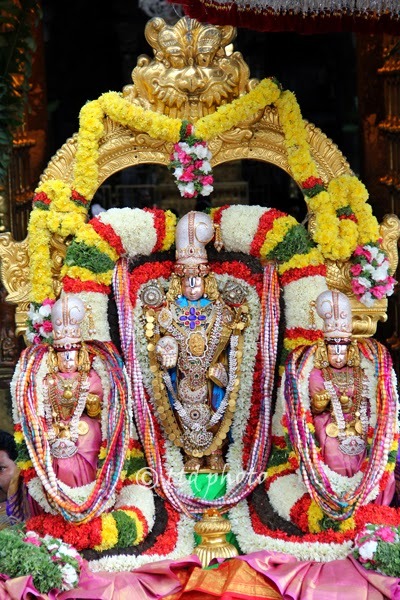 Tirumala Tirupati Devasthanams TTD celebrates Srivari Annual Jyestha Abhishekam Festival for three days in the month of Jyestha Masam(June/July) every year in Srivari Temple, Tirumala. The Jyestha Abhishekam is also known as Abhideyaka Abhishekam. Srivari Jyestha Abhishekam begins on the day of Shukla Tryodasi of Jyestha Masam and concludes on Full Moon Day of Jyestha Masam. This year 2015, Srivari "Jyestha Abhishekam Festival" will be conducted from June 1, 2015(Monday) to June 3, 2015(Wednesday). 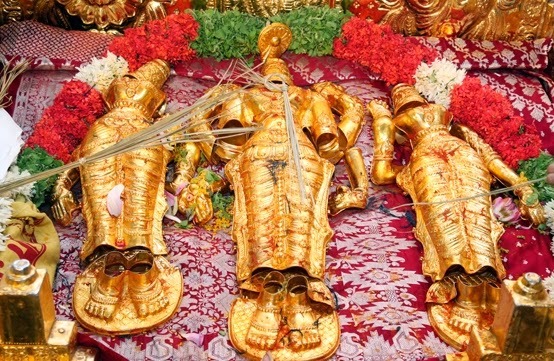 The essential purpose of the Jyestha Abhishekam is to protect the Utsava Deities - Sri Malayappa Swamy, Goddess Sridevi and Goddess Bhudevi from damage which might occur during Processions and Tirumanjanam through various Pujas/Poojas and Mantras on these three days.The festival is held in the Kalyanamadam in a solemn manner inside Tirumala Temple. On the first day Lord Sri Malayappa Swamy along with Goddess Sridevi and Bhudevi is brought to the Kalyana mandapam in the Sampingi Pradakshina and performs Abhishekam and Snapana Tirumanjanam with Pachamritams comprising Milk, Curd, Honey, Sandal Paste and Turmeric after removing Golden Armour on Lord Malayappa Swamy. Later Vajrakavacham (Diamond Kavacham) is adorned to the deities and they are taken out for Procession along the temple streets. On the second day after performing the Abhishekam and Snapana Tirumanjanam to the deities, adorned with Pearl-studded Kavacham (Coat of Pearls[Mutyalu]) and taken out in procession in the temple streets. On the third day also after performing the Abhishekam and Snapana Tirumanjanam to Lord Malayappa Swamy,Goddess Sridevi and Bhudevi, decorated with Golden Kavacham and takes for procession.